A mind-map is a graphic representation of ideas (usually generated via a brainstorming session). It shows the ideas which are generated around a central theme and how they are interlinked. It is a tool primarily used for stimulating thought. An easy and fun tool to use for brainstorming. Helps organize and structure ideas. Stimulates the generation of new ideas. Helps represent the logical flow of the thought process. What distinguishes an average essay from a great essay? Quality of content, close attention to writing style and correct grammar are all very important, but another crucial element is the structure and organization of the essay content. If you have trouble organizing your thoughts and arguments in a logical fashion mind mapping can help. Not only can mind mapping help you decide the content of an essay, it is an almost indispensable tool for organization and structure. A mind-map can be created using a regular pen and paper or whiteboard, or it can be created on the computer using various software. 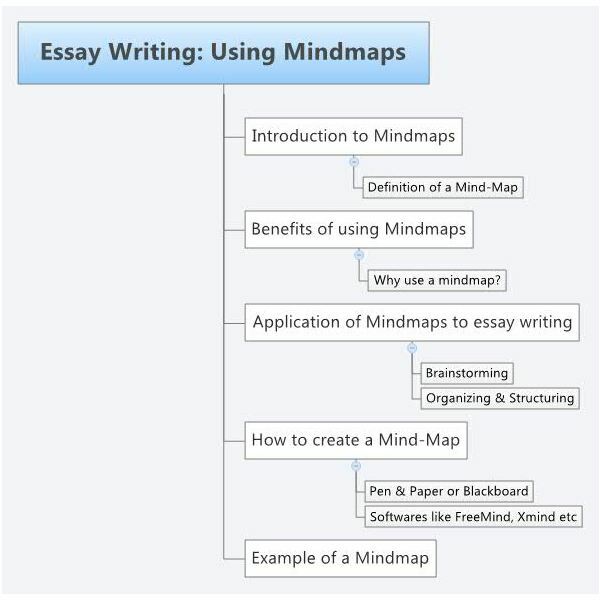 Examples of free software which can be used to create mind-maps are FreeMind and XMind. If you are more technically inclined, you can study this comparison of the various Mind-Mapping software before picking one to use. While creating a mind-map manually, write a central idea/topic and branch out with sub-topics. Link ideas in a parent-child structure and interlink related ideas. It will help develop an overall structure which provides a more comprehensive perspective. As more ideas come in, the structure may become cumbersome. In this case, it may be preferable to go ahead with a software based approach using the tools mentioned above. Most are self-explanatory. Amazon.Com has a few books on Mind-Mapping which can be obtained here. A book on Mind-Mapping for Kids can be obtained here. Below is an example of a Mind-Map which I created to help me write this article. It is rather simplistic in nature but demonstrates how it can be used.Click on the image below to enlarge it.